There is something completely unexpected in the strange correlation and synergy between the work of these two artists. While it is inadvisable to compare and contrast (why pick those particular images out of thousands! 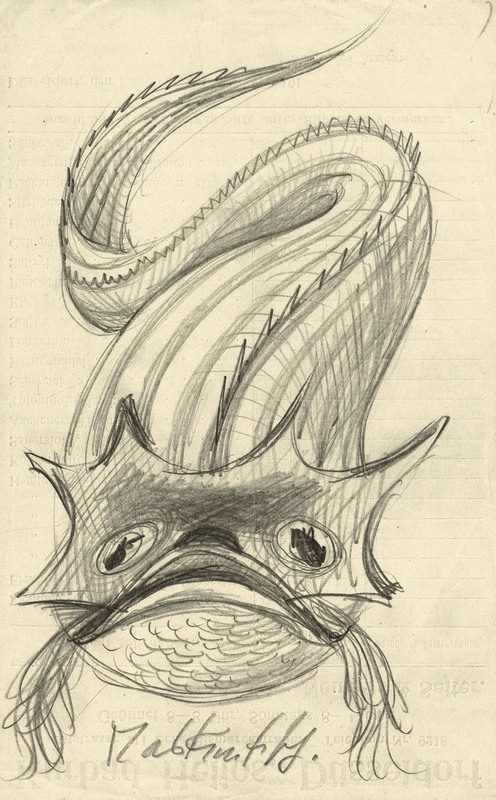 ), I have paired several images from the exhibition together in this posting. Let’s look at the pairing above. 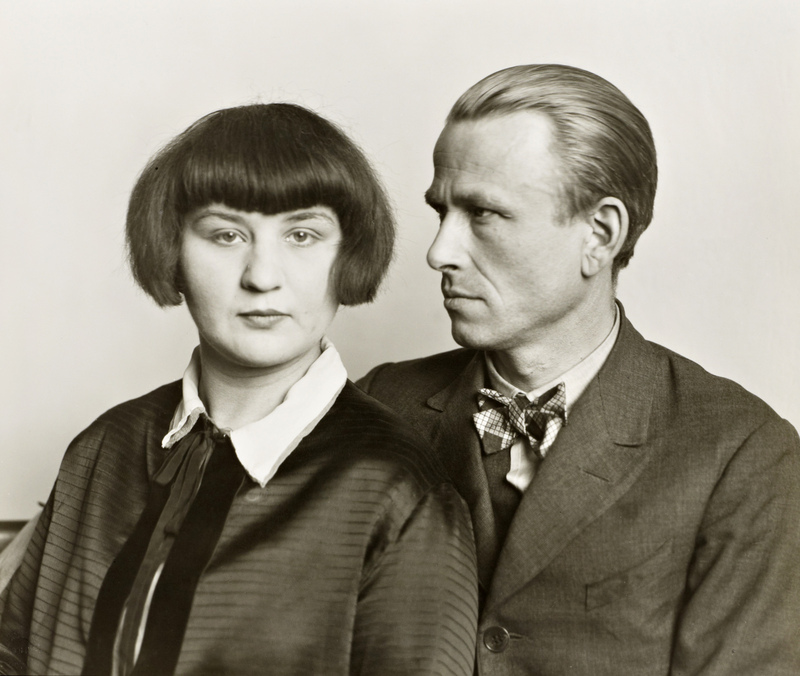 Technically, Sander’s photograph of The Painter Otto Dix and his Wife Martha (1925-6) evidences a slightly flattened perspective especially in the “face on” aspect of the androgynous woman – but the photograph also possesses a surreal air, the silhouette of the woman’s hair contrasting with the swept back slickness of the man and his jutting, three-quarter profile. The unusual space between them adds admirably to the overall frisson of the photograph, it’s non/objectivity and performativity. 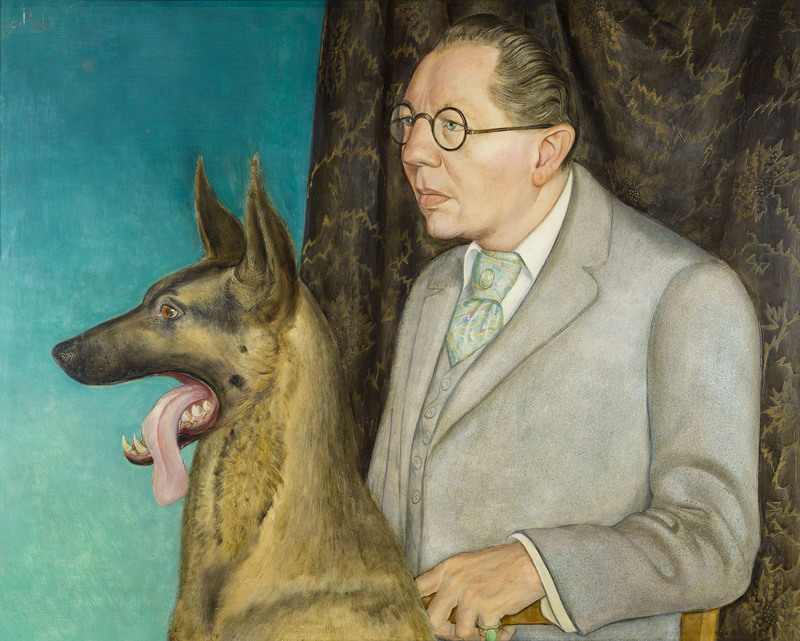 In Dix’s painting Hugo Erfurth with Dog (1926) a greater distortion of perspective is in evidence. The mythic dog is painted as if photographed using a telephoto lens, while the man’s face is all over the place… the jaw elongated as if by using a wide angle lens, the front of the face flattened in an earnest manner. This is what painting can do, and is allowed to do, that photography can never match. But it doesn’t have to. It does it in a different way. Here we need to excavate – that’s a good word for this investigation – we need to excavate the ethos in the zeitgeist. We need to understand the attitudes and aspirations of the cultural era in which these artists lived in order to comprehend the defining spirit of the period, as shown by the ideas and beliefs of the time. These artists emerge out of the same society, they inhabit the spirit of the age – those interwar years of the avant-garde, speed, and change; of poverty, postwar realities and politics; of The Great Depression, disfiguration and disenfranchisement. I look at the obscurity of faces in Dix’s Assault Troops Advance under Gas (1924) and then adjust to the pensiveness of hand, pose and gaze in Sander’s Working Students (1926) … and then mentally add in Avedon’s later portraiture. Interesting. 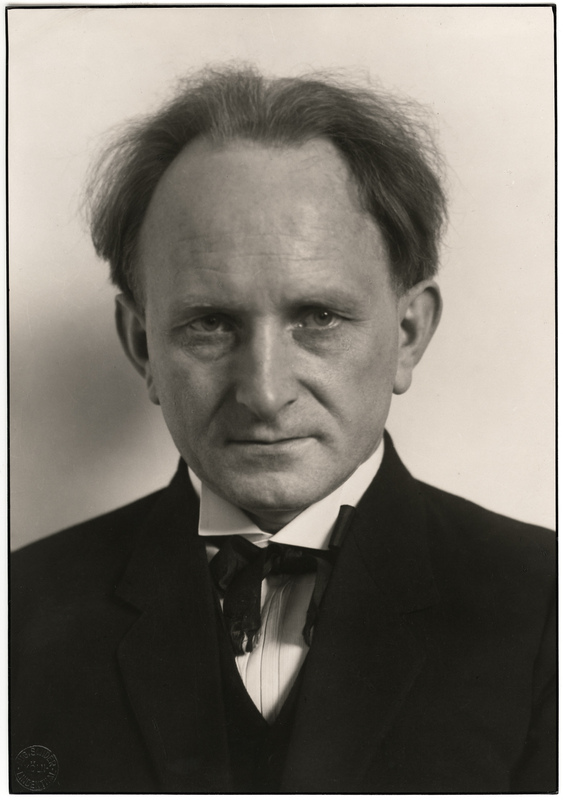 I look at Sander’s National Socialist, Head of Department of Culture (c. 1938) and note the “exemplary mastery of illumination”, but just as distinctively the averted gaze, the line on head where the unnamed man (who is he? what was his name?) had just taken his cap off. 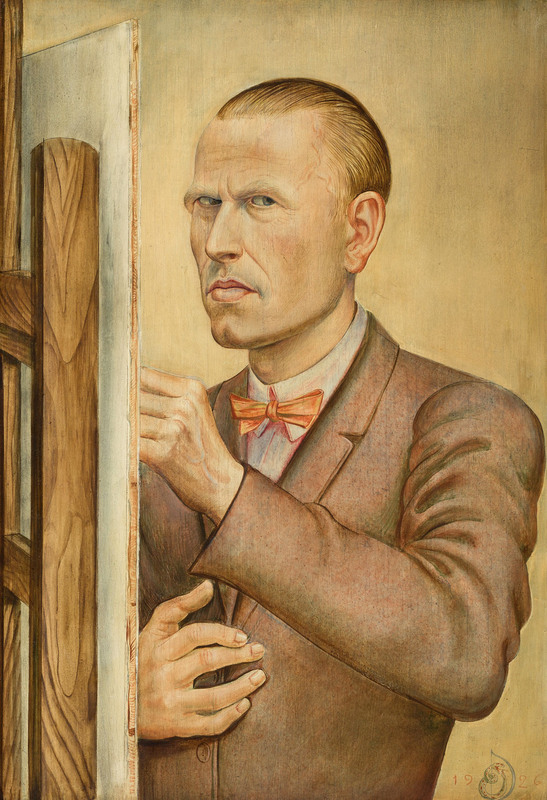 Just below is Dix’s Self-Portrait with Easel (1926) with three-quarter profile, piercing stare, bent finger. Who is capturing reality here? No body. In his own way, Sander plays with the reality of time and space just as much as Dix. In my mind, Sander’s “staged performativity and the artifice of construction [which] is paramount to the surreal effects created,” are no less un/real than the paintings of Dix. There are things that just don’t fit. The strangeness of the era, the creation of these non/objective environments, cause an alignment of the stars between both artists. 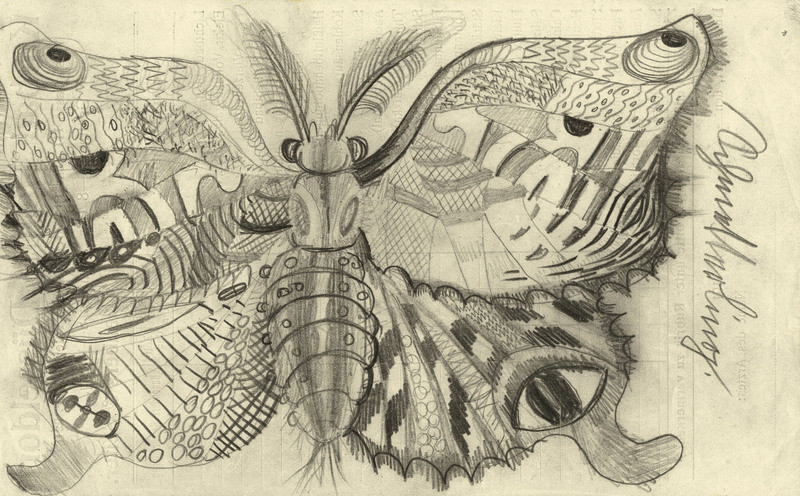 This is inspired curating, to bring these two extra-ordinary talents together. These artists walked the same streets, they breathed the same air. They excavated the spirit of the age. And in so doing, their art becomes impervious to time. Many thankx to Tate Liverpool for allowing me to publish the photographs in the posting. Please click on the photographs for a larger version of the image. 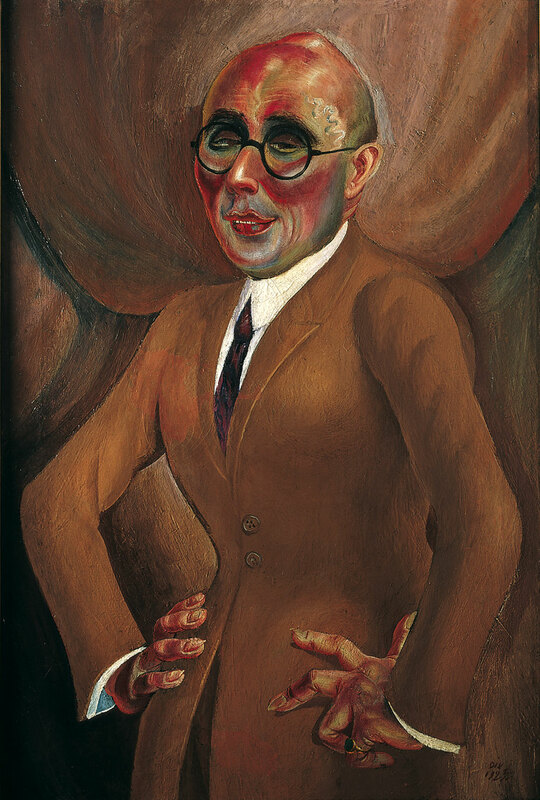 Dix was a key supporter of the New Objectivity (Neue Sachlichkeit) movement, a name coined after an exhibition held in Mannheim, Germany in 1925. Described by art historian G.F. Hartlaub, as ‘new realism bearing a socialist flavour’, the movement sought to depict the social and political realities of the Weimar Republic. 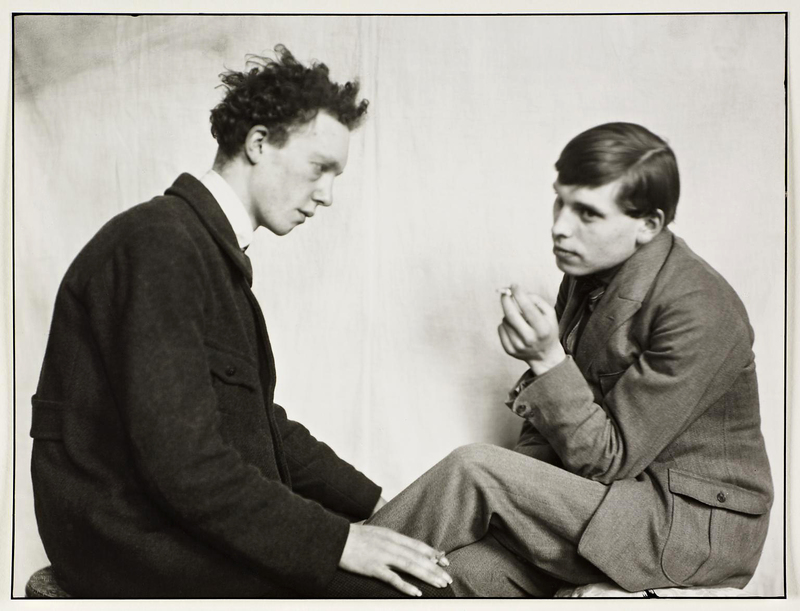 Tate Liverpool presents the faces of Germany between the two World Wars seen through the eyes of painter Otto Dix (1891-1969) and photographer August Sander (1876-1964). 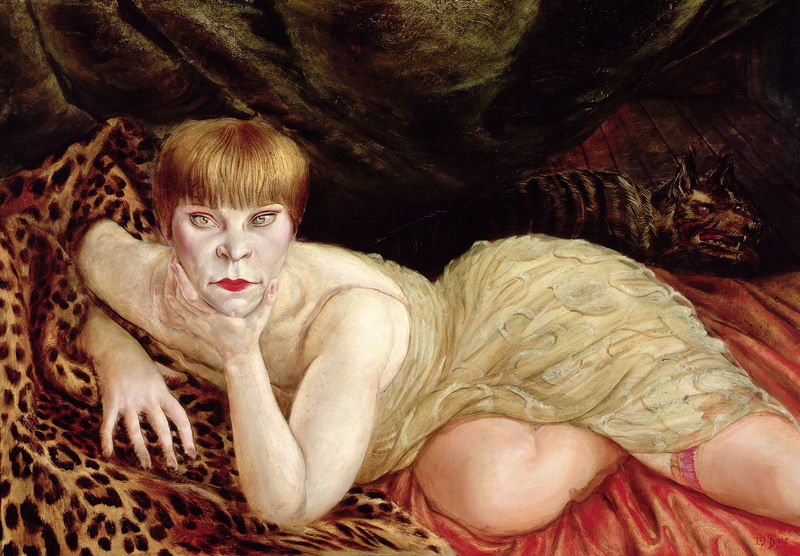 Portraying a Nation: Germany 1919-1933 brings together two artists whose works document the glamour and misery of the Weimar Republic, a time of radical extremes and political and economic upheaval. Portraying a Nation, which exhibits Dix and Sander as a pair for the first time, reflects a pivotal point in Germany’s history, as it introduced democratic rule in the aftermath of the First World War. 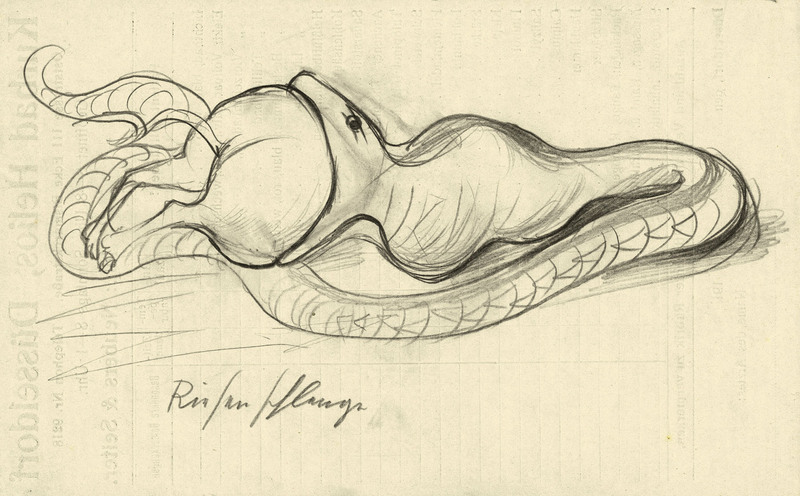 The period was one of experimentation and innovation across the visual arts, during which both artists were concerned with representing the extremes of society, from the flourishing cabaret culture to intense poverty and civilian rebellions. Featuring more than 300 paintings, drawings, prints and photographs, Portraying a Nation unites two complementary exhibitions. Otto Dix: The Evil Eye explores Dix’s harshly realistic depictions of German society and the brutality of war, while ARTIST ROOMS: August Sander presents photographs from Sander’s best known series People of the Twentieth Century, from the ARTIST ROOMS collection of international modern and contemporary art. The exhibition focusses on the evolution of Dix’s work during his years in Düsseldorf, from 1922 to 1925, when he became one of the foremost New Objectivity painters, a movement exploring a new style of artistic representation following the First World War. Dix’s paintings are vitriolic reflections on German society, commenting on the country’s stark divisions. His work represents the people who made up these contradictions in society with highlights including Portrait of the Photographer Hugo Erfurth with Dog 1923, Self-Portrait with Easel 1926, as well as a large group of lesser known watercolours. 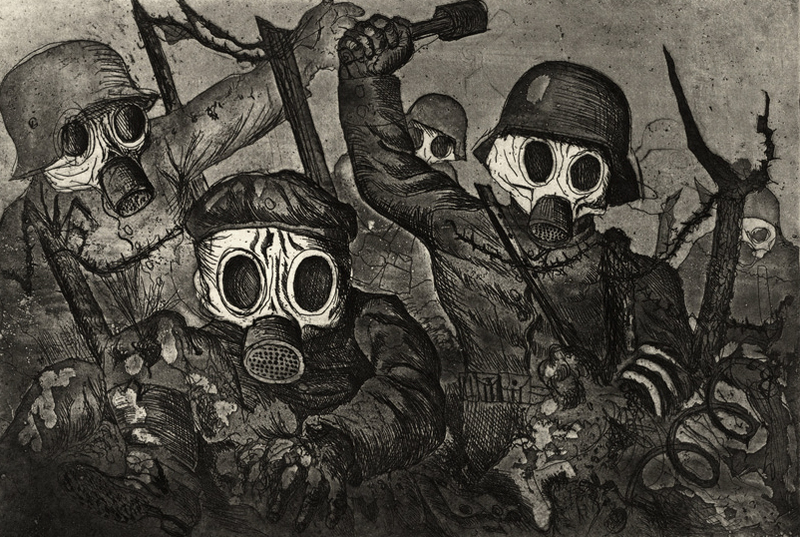 Dix’s The War 1924 will also form a key element of the exhibition, a series of 50 etchings made as a reaction to and representation of the profound effect of his personal experiences of fighting in the First World War. Sander’s photographs also observe a cross-section of society to present a collective portrait of a nation. Sander commenced his major photographic project People of the Twentieth Century in 1910, an ambitious task that occupied him until the 1950s. 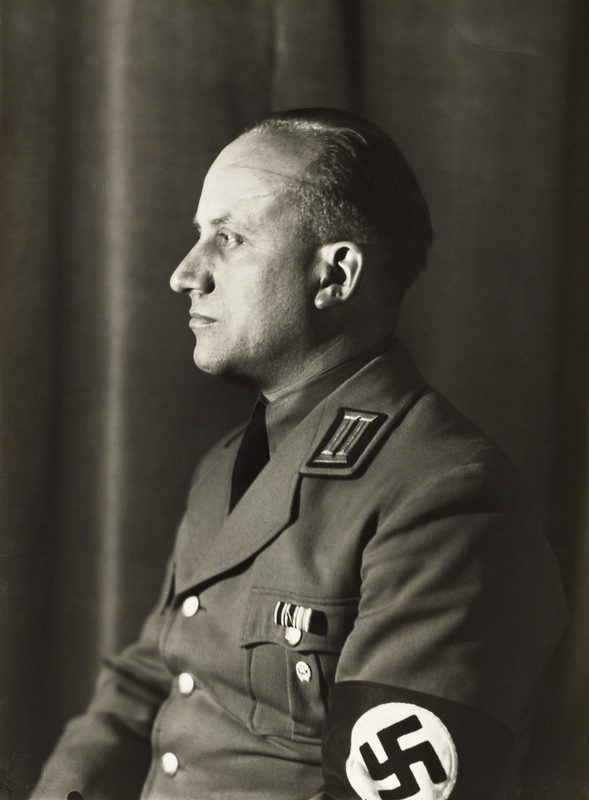 The project resulted in more than 600 images in which people were categorised into what he described as ‘types’, including artists, musicians, circus workers, farmers and, in the late 1930s, images of Nazi officers. 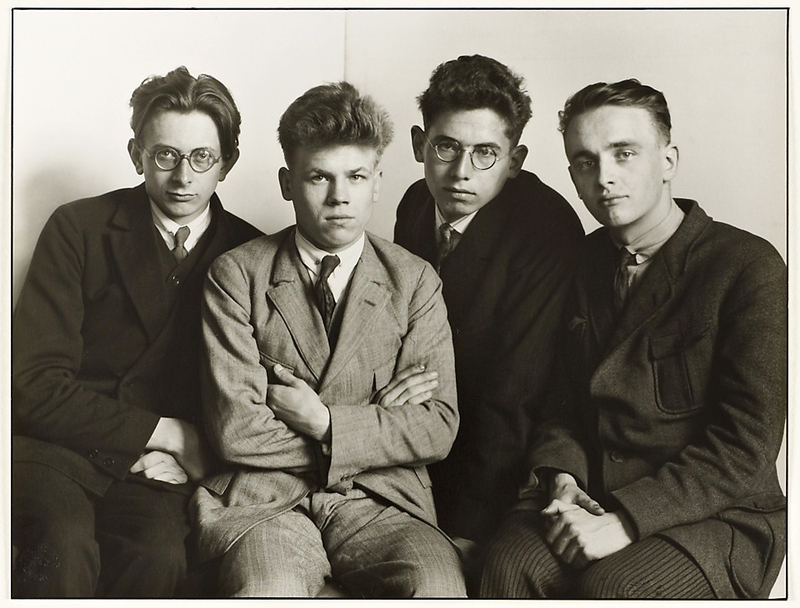 More than 140 photographs from the ARTIST ROOMS collection will be displayed to create a large-scale timeline of Weimar Germany, placing individual subjects against a backdrop of the era’s tumultuous cultural and political history. 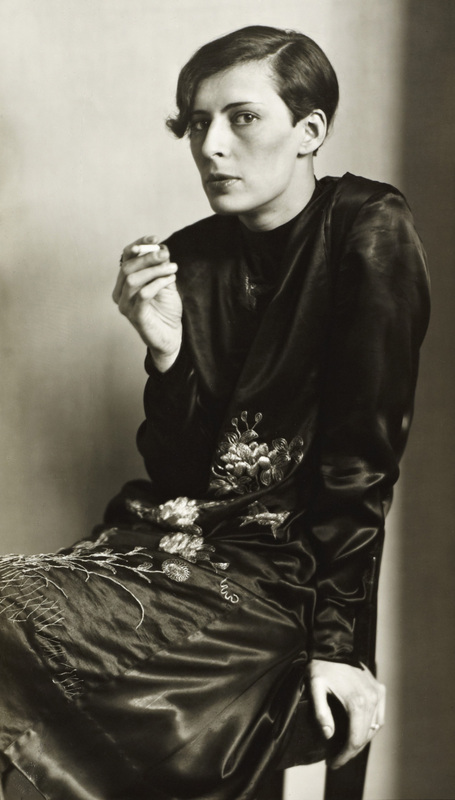 Portraying a Nation: Germany 1919-1933 is made up of Otto Dix: The Evil Eye, Kunstsammlung Nordrhein-Westfalen, Düsseldorf and ARTIST ROOMS: August Sander, an exhibition of works from the ARTIST ROOMS collection of international modern and contemporary art. The ARTIST ROOMS collection is jointly owned by National Galleries of Scotland and Tate on behalf of the public, and was established through The d’Offay donation in 2008 with the assistance of the Heritage Memorial Fund, Art Fund and the Scottish and British governments. It is shared with UK museums and galleries including Tate, National Galleries of Scotland and a network of Associate venues through ARTIST ROOMS On Tour, which is a partnership until 2019 with lead Associate Ferens Art Gallery, supported by the National Lottery through Arts Council England, Art Fund and the National Lottery through Creative Scotland. 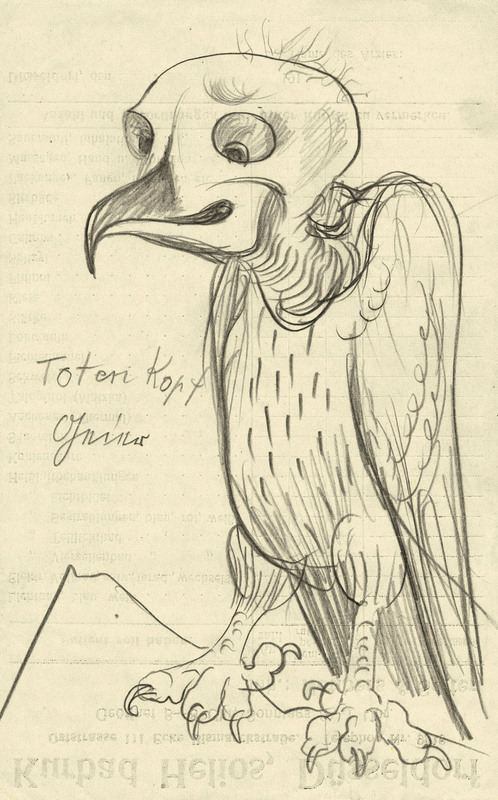 Otto Dix: The Evil Eye is curated by Dr Susanne Meyer-Büser, Kunstsammlung Nordrhein-Westfalen, Düsseldorf, Francesco Manacorda, Artistic Director and Lauren Barnes, Assistant Curator, Tate Liverpool. 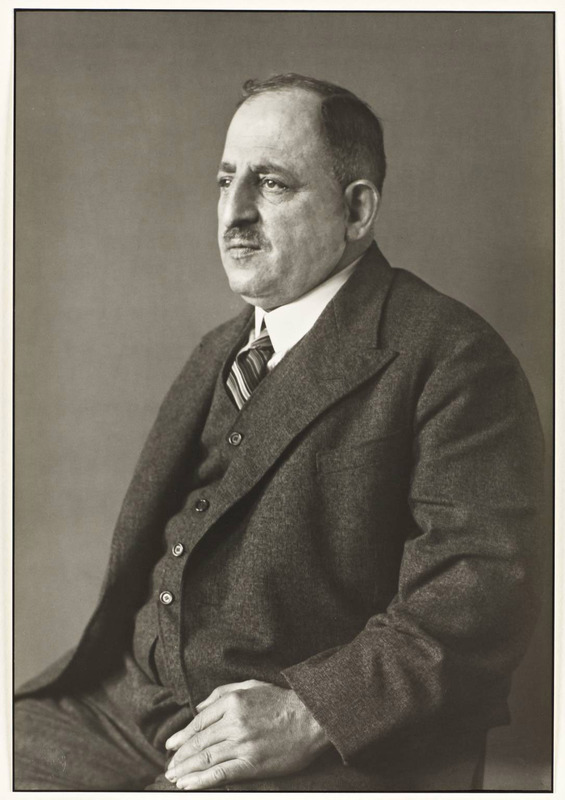 ARTIST ROOMS: August Sander is curated by Francesco Manacorda, and Lauren Barnes, Assistant Curator, with the cooperation of ARTIST ROOMS and the German Historical Institute. 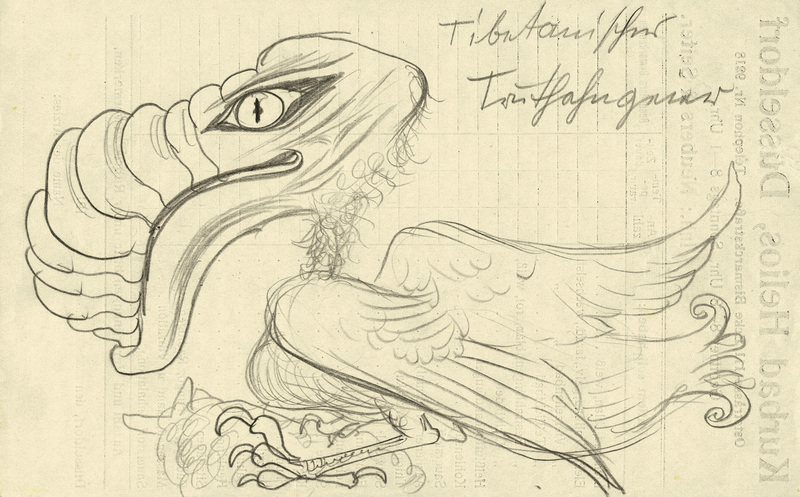 When the Nazis came to power in 1933, Dix was dismissed from his professorship teaching art at the Dresden Academy, where he had worked since 1927. The reason given was that, through his painting, he had committed a ‘violation of the moral sensibilities and subversion of the militant spirit of the German people’. 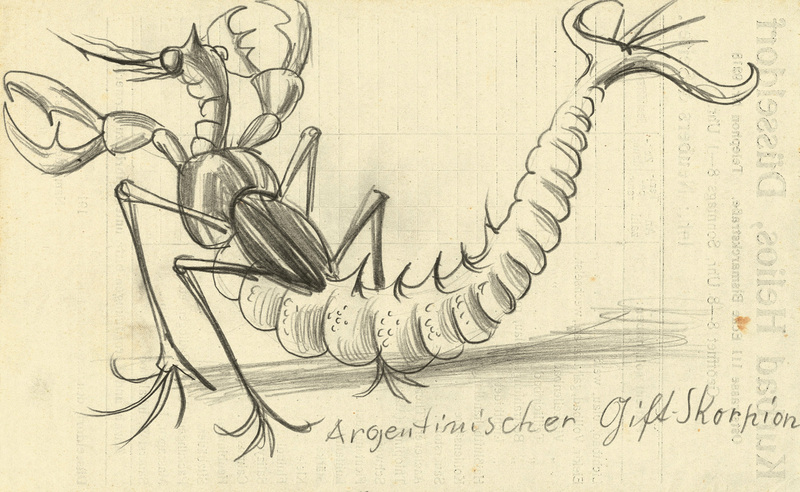 In the years following, some 260 of his works were confiscated by the Nazi Propaganda Ministry. Several of these works, including The Jeweller Karl Krall 1923 (which features in the Tate Liverpool exhibition Portraying a Nation), appeared in the Entartete Kunst (degenerate art) exhibition of 1937-8. The exhibition was staged by the Nazis to destroy the careers of those artists they considered mentally ill, inappropriate or unpatriotic. In the mid-1920s, Sander began his highly ambitious project People of the 20th Century. 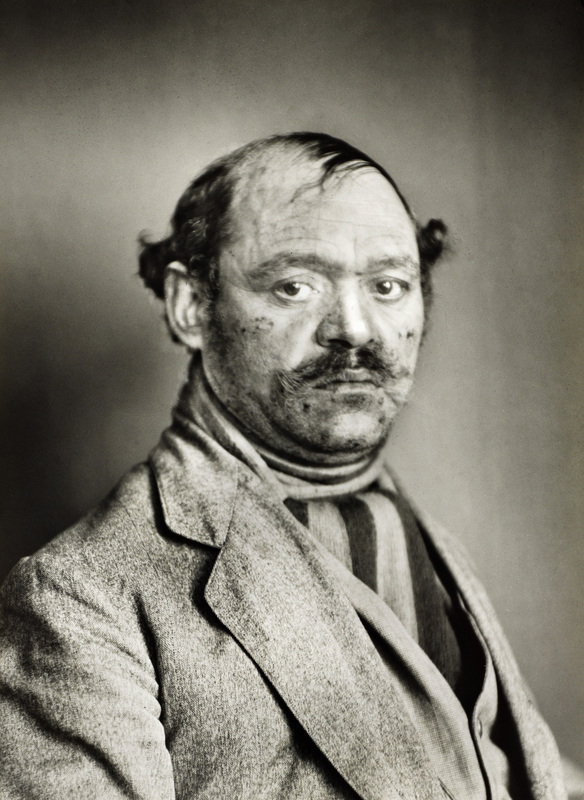 In it, Sander aimed to document Germany by taking portraits of people from all segments of society. The project adapted and evolved continuously, falling into seven distinct groups: ‘The Farmer’, ‘The Skilled Tradesman’, ‘The Woman’, ‘Classes and Professions’, ‘The Artists’, ‘The City’ and ‘The Last People’. Sander once said ‘The portrait is your mirror. It’s you’. He believed that, through photography, he could reveal the characteristic traits of people. He used these images to tell each person’s story; their profession, politics, social situation and background. Sander did not use the newly invented Leica camera. Instead he remained devoted to an old-fashioned large-format camera, glass negatives and long exposure times. This allowed him to capture minute details of individual faces. Sander prized the daguerreotype, a photographic process introduced in the previous century, of which he said: ‘it cannot be surpassed in the delicacy of the delineation, it is objectivity in the best sense of the word’. Allied to this, his portraits were anonymous. Shot against neutral backgrounds and titled more often than not by profession alone, he let the images – and the faces in them – speak for themselves. The ambition and reach of People of the 20th Century (both in terms of the quality of his photography and in his representation of a cross-section of society) made him a monumental figure of twentieth century photography. The likes of American social realist photographers such as Walker Evans and Dorothea Lange (whose works became iconic symbols of the depression), and later photographers such as Diane Arbus, each owe a debt to the trailblazing Sander. 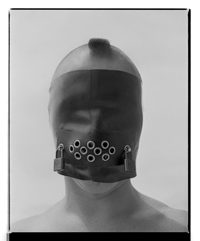 More recently, the work of conceptual artists such as Bernd and Hilla Becher (known for their typologies of industrial buildings and structures) and Rineke Dijkstra, whose photography is infused with psychological depth and social awareness, resonates with the influence of August Sander’s career-long project.